No.1 in Japan for Two Straight Years 2005-2006! 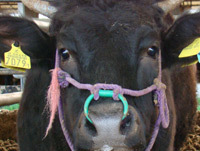 Nozaki-gyu is produced from Kagoshima Top-Grade Japanese Black cattle and was the first beef in Japan to bear the name of a person as a brand name. The thorough management technology and deep consideration for the cattle used to raise these cattle has earned them many awards in Kagoshima Prefecture. Nozaki-gyu made history by being the first brand ever to win top honors for two consecutive years at the National Beef Cattle Dressing Competition held at the Tokyo Meat Market. These beef cattle are raised with great care using specially selected feed and a carefully controlled environment. Our cattle are carefully raised with affection and respect.